Yusef and Benyam Workinah Martin were the sons of Hakim** Workinah Eshete, known to the English by his adoptive name of Charles Workneh Martin. Their father had been found abandoned on an Ethiopian battlefield as a small child and taken by a British army officer to India, where he was brought up and educated. He became the first Ethiopian to qualify as a medical doctor and worked as a civil surgeon in Burma, returning to Ethiopia from time to time before settling more permanently there after the First World War. He was influential in education and government, led a diplomatic delegation to the USA in 1927, was appointed Governor of Chercher province in 1930 and Ethiopian Ambassador to London in July 1935. Yusef and Benyam were brought up bilingual in English and Amharic. In 1924 their father brought them to England to be schooled and they were admitted to Trent College, where they were known as Joe and Ben. In 1931 they both applied to Loughborough College, Joe to study Commerce (though he eventually chose Mechanical Engineering), and Ben to do Civil Engineering. 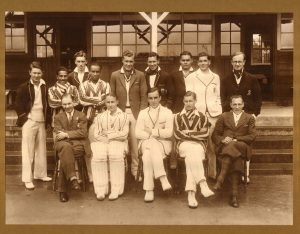 The Martin brothers boarded in the newly opened Rutland Hall and were keen sportsmen: they both played cricket (Joe was captain in 1935), while Joe also played hockey and Ben rugby. After Ben got his Diploma in 1935 he and Joe went to London where they acted as assistants to their father in the Ethiopian Legation. In October 1935, however, they returned to Ethiopia to help in their country’s struggle against the invading Italian army. They carried with them over a hundred gas masks. For a time they acted as interpreters to the British Ambulance Service. It was reported that ‘they immediately seized upon the two motor bicycles of the unit and raced round the streets of Addis Ababa to the consternation of the people and to the evident admiration of their friends.’ They were later withdrawn from the BAS for technical work on munitions in Addis Ababa, until ordered by Emperor Haile Selassie to join the forces fighting the Italians in Western Ethiopia. Ben, who was asked to take photos and write articles, implied in a letter to his father that he was the leader of the resistance group the ‘Black Lions’. In May 1936 the Emperor was forced into exile and by December the Martin brothers had no choice but to surrender to the Italians. They were put to work in Italy’s central workshop in Addis Ababa but in the massacre that followed the attempted assassination in February 1937 of the Italian Viceroy, Marshal Graziani, they were arrested at night and summarily shot.